Family Connections—Sarah came from Ur of the Chaldees, Babylonia, and her former name Sarai, “princely,” identifies her as coming from an honored family. She was the daughter of Terah and was therefore half-sister to Abram, her senior by ten years (Genesis 17:17), whom she married in the Ur of the Chaldees. While Abram and Sarai had the same father, they had different mothers (Genesis 20:12). Marriages between near relatives were countenanced in those days and were sometimes common for religious reasons (Genesis 24:3, 4; 28:1, 2), but not marriages between those actually by the same mother. Sarai was well past middle life and childless when with Abram she left her own country and with him went out “not knowing whither they went” (Genesis 11:29, 30). Sarah remains the first unquestionably historical woman of the Hebrews, and their first mother. She is, therefore, one of the most important female figures in the world’s history, as the natural source of the Jewish people, through whom the nations of the earth were to be blessed. The testimony of the Bible is that Sarah was unusually beautiful (Genesis 12:11, 14). Even when she was 90 years of age she was so lovely that Abraham feared that kings would fall in love with her bewitching beauty—which Pharaoh and Abimelech did, as our next glimpse of her proves. As one of the most beautful women who ever lived we can imagine that wherever she journeyed the admiring eyes of all were cast upon her. “Grave is all beauty,” and Sarah’s renowned loveliness certainly brought its trouble. When famine drove Abraham and Sarah into the land of Egypt, and they felt that hostile kings might take them prisoners, Abraham came up with the abject, base proposal that if taken prisoners then his wife should represent herself as his sister. Fear of death unmanned him and led him to risk the dishonor of his wife and thereby save his own neck. She dearly loved her husband, and his life was too precious to her to make her think of the shame she might incur. Sarah was utterly wrong in yielding to her husband’s plot. How nobler she would have been had she stoutly refused Abraham saying, “How can I do this great wickedness and sin against God?” But she called her husband “lord,” and evidently he was lord of her conscience. Abraham felt that if oriental despots knew that Sarah and he were married they would slay him and add the lovely woman to their harem. Married to a conspicuous beauty caused Abraham to be afraid, and he resorted to a falsehood to save his life. If taken, Sarah was not to say that she was his wife but his sister. This pretense was not an outright lie, but a half-truth, seeing that she was his half-sister. They were children of the same father, but not the same mother. It seems hard to believe that such a good man could deliver his lovely wife over to a heathen monarch, but he did, and Sarah entered Pharaoh’s harem. But God protected her by sending plagues upon the monarch. Pharaoh sent her back to her own husband, untouched. The same unworthy plan was carried out when Abimelech, king of the Philistines, admiring her bewitching beauty had her taken to his harem. But again God interfered and commanded the king to restore Sarah to Abraham, seeing she was his wife. Threatened with violent death, Abimelech obeyed, but severely rebuked Abraham for his deceit. Sarah revealed the sad defect of her qualities when she said to Abraham, “Take Hagar my maid, and let not the promises of God fail through me. Through her I can continue your hereditary line.” But all poor Hagar could do was to produce an Ishmael. 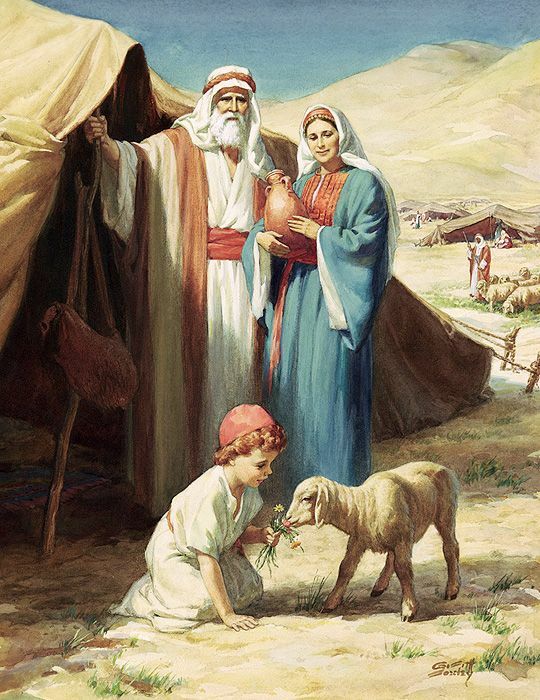 It was only through Sarah that the promised seed could come. Although it might have been a custom of the time for a man with a barren wife to take a concubine in order that he might have an heir, Abraham, as a God-fearing man, should have stoutly refused to go along with the unworthy scheme, which in the end produced jealousy and tragedy. “Abram hearkened to the voice of Sarai,” but the voice was the fatal siren of Satan who sought to destroy the royal, promised seed (Genesis 3:15). In His forgiving love and mercy God appeared to Abram when he was 99 years old, and assured him that his long barren wife, although now 90 years old, would conceive. To confirm His promise God changed the name of Abram to Abraham, and of Sarai to Sarah (Genesis 17; 18). At such a revelation of God’s purpose, “Abraham fell upon his face and laughed.” Although he marveled at the performance of the naturally impossible, Abraham yet believed, and his laughter was the joy of a man of faith. Laughter is sometimes mad (Ecclesiastes 2:2) but that of Abraham was highly rational. He rejoiced in the thought that Isaac should be born, and perhaps at that time he had a vision of the Messiah. Jesus said, “Your father Abraham rejoiced to see my day” (John 8:56). As for Sarah, what was her reaction when she overheard the Lord say to her husband, “Sarah thy wife shall have a son”? The record says, “Sarah laughed within herself,” but hers was the laugh of doubt. Yet when her son was born he was named Isaac, which means “laughter”—a memorial of her sin (Genesis 18:13), and of her husband’s joy (Genesis 17:17). Sarah’s joy knew no bounds, “God hath made me to laugh” (Genesis 21:6; 24:36). She had laughter before, but God was not the author of her laugh of doubt. The joy of Sarah in the birth of Isaac reminds us of “the great joy” proclaimed by the angels who made known to the shepherds the birth of Christ who came of the line of Isaac (Luke 2:10; Romans 4:18-21). Paul reminds us that it was by faith that Sarah conceived beyond nature (Hebrews 11:11). It was not only in itself a miracle wrought by faith, but also in earnest of something far greater, even the Incarnation of Jesus Christ.